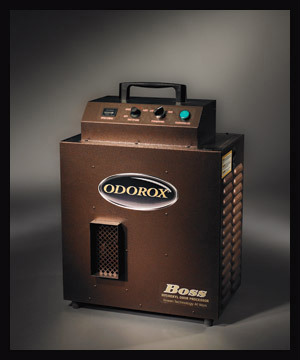 The Odorox® Boss is hugely versatile, a best selling unit that can be applied to a huge range of applications up to fire and water damage restoration work where it has been particularly successful. It's power allows it to easily deodorize and decontaminate up to 2500 sq.ft. (250 sq.m.) depending on the level of contamination and assuming a 9ft/3m ceiling space. The Boss™ is designed for heavy concentration processing but operates using only 1.9 amps. The Boss™ unit is equipped with a selector switch for 1 or 2 hydroxyl generating optics and a washable filter. The built-in fan is adjustable from approximately 250 to 500 cfm which adds to the unit's versatility. On low fan speed the unit is able to deodorize small areas such as cars, RVs, boats, bedrooms or offices. Turning the fan to high enables treatment of larger or more intensely affected areas such as basements, homes and businesses.